For the last few weeks, we’ve been sharing insights from PSFK’s Future of Manufacturing report, a collaboration with Microsoft. Here we bring together five report scenarios that illustrate the technologies and processes behind a connected supply chain. From agile production lines creating affordable, customized products for every consumer to data collection that ensures efficient daily operations and troubleshoots problems before they occur, manufacturing is becoming more flexible and better able to serve customers. Take a look at these themes and click through to see each one explored in detail. The excerpt below is a snapshot of the analyses provided in the Future of Manufacturing report. Click here to download the full free report, which includes expert insights, key scenarios and enabling technologies. Because customers’ needs and preferences can change dramatically alongside competing market forces, product developers and designers need to work across teams in real time to maximize speed and efficiency. To ensure products have the greatest impact, the development cycle must be a fluid process, allowing feedback from customers and quality assurance tests to be integrated during prototype stages or even after a product has reached the market. As consumers are increasingly looking to assume the role of creator, manufacturers need to seek ways to introduce customization to their supply chains—without disrupting standardized, mass production. In order to deliver an affordable, custom product with quick turnaround times, manufacturers must have production lines that are flexible enough to handle multiple variations on a product type, while ensuring the right mix of materials and components are always on hand. Siloed factory operations can lead to the inefficient expenditure of resources and delay the path from raw material acquisition to order distribution—or worse, compromise the safety of employees. In order to ensure efficient and safe operations throughout the factory, all components must be seamlessly interconnected, relying on data from previous operatives to inform daily operations and future tasks. In order to optimize production to meet the constantly fluctuating demands of their customers, manufacturers must work diligently with suppliers, buyers and distributors to create a flexible logistics network that offers an accurate picture of inventory, from raw materials to finished products, and helps move products efficiently to the desired destination. Large-scale manufacturers that deliver goods or services to a variety of locations need to leverage software that can sync to multiple field employees who are servicing a range of assets. By outfitting their products with the ability to communicate diagnostics, repair management or service statuses back to a cloud server, the manufacturer’s central team will be able to predict the impact of external forces on service or staffing needs. 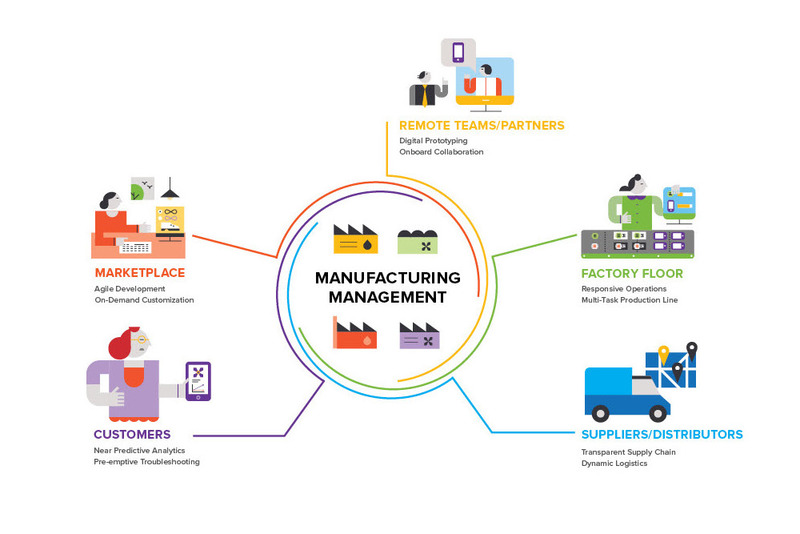 In partnership with Microsoft, PSFK presents the Future Of Manufacturing report, an opportunity playbook that explores a new era of supply chain management and the technologies that enable faster, more agile manufacturing operations. Tune into psfk.com for a 10-week in-depth look at expert insights, key findings and detailed scenarios, or download the full report here.